Team's Challenge | Project Calculator | Team Industries | TEAM Industries Inc.
Have you ever wondered what pipe/tank fabrication would be like “Fabricated Right the First Time”? 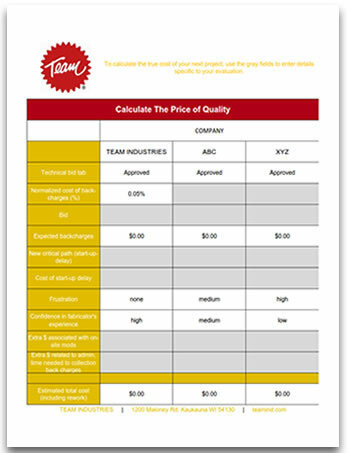 Team has an extremely low – the lowest – back-charge rate in the industry. It’s 0.05% of the contract value for the last 10 years. We've created a handy calculator to help you capture some of the costs you need to consider as you evaluate the bids you receive. Each element is important, real, and has long-term effects. If you'd like to talk through any part of this with a Team member, don't hesitate to contact us today. To get your free calculator, just fill out the form at right!